The scene was set for the Pittsburgh Penguins to make a statement on national television that their pitiful month of November was a fluke. After capturing a possible seven of their last eight points, the Penguins were ousted 6-3 by the Chicago Blackhawks, which ended the Blackhawks’ eight-game losing streak. The final score was skewed by two empty net goals, but the Penguins failed to capture what would have been a huge two points and put them into the third place spot in the Metropolitan Division. Escaping a 2-0 and 3-2 deficit, the Penguins went into the third period tied 3-3, but were unable to find the difference-maker and left the United Center with their tails tucked between their legs. 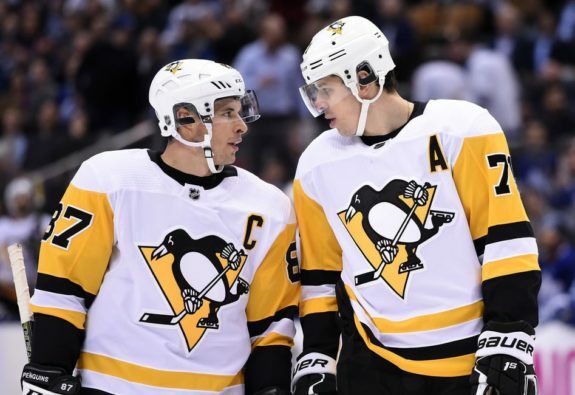 While the loss to the Blackhawks was a complete and utter disappointment, there was one gigantic upside that the Penguins have been needing all season – scoring support from their bottom six. It has been a problem that has plagued them all season, but Bryan Rust netted all three goals for the Penguins and captured his second career hat trick. Before Wednesday night’s tilt, Rust hadn’t scored in 21 games. Rust scored his three goals in three completely different fashions. With the Penguins down 2-0 late in the first period, Rust stepped out of the corner and sniped one right over the glove hand of Corey Crawford. The goal was a much-needed shift in momentum as the Penguins went into the locker room. Rust’s second goal came from a rebound off a shot from Derek Grant, and his third goal was on a ridiculous bounce off Blackhawks’ defenseman Brent Seabrook. If the Penguins are going to turn their season around and be taken seriously by the rest of the league, their secondary scoring is going to need to be consistent, and a hat trick by Rust is a great way to start. Of course, it’s impossible to expect a hattie every game, but the Penguins got offensive contributions from Grant, Olli Maatta, and Zach Aston-Reese as well. It’s unfortunate that Sidney Crosby (although he played well and had ample opportunities), Evgeni Malkin, Kris Letang and Phil Kessel (who is currently rumored to be on the trading block) were all left off the scoresheet, but Rust’s hat trick will hopefully spark the bottom-six forwards for the Penguins and get them to contribute on a more consistent basis. If all four lines can consistently contribute offensively, this team is going to be dangerous. Ever since the departure of Carl Hagelin, the Penguins’ special teams have been an absolute nightmare. Power play opportunities were few and far between on Wednesday night, but the Penguins looked absolutely lost with the man advantage. The Blackhawks only took two penalties, but the Penguins failed to create any sort of offense on either of them. Their zone entries were good, and they were able to maintain possession, but they failed to move the puck into the scoring areas at all. They seemed content with just passing the puck up and down the wall until the two minutes expired. After being shut out again by the Blackhawks, the Penguins are now 2-for-15 on the power play in their last seven games. Their power play, which led the NHL last year, has dropped down to 22.2% and has slipped to 10th-best in the league. With guys like Crosby, Malkin, Letang, Kessel, and Jake Guentzel on the ice, failing to even generate a scoring chance on two power plays is unacceptable. 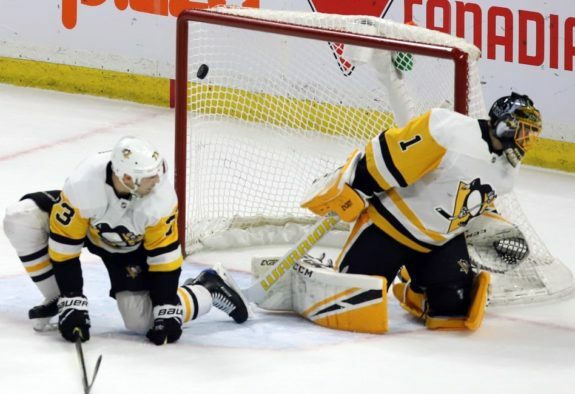 Hopefully, the return of Patric Hornqvist to the lineup will spark the Pens’ power play, but it has looked disastrous as of late and failed to show up in the key moments of their loss to the Blackhawks. The second unit also needs to be given a complete makeover. Coach Mike Sullivan has had Olli Maatta and newly-acquired defenseman Marcus Pettersson operating it, which makes zero sense. Both are solid players, but neither one has much offensive upside. Maatta is yet to score all season and Pettersson only has one goal in his short career. If you look at the stat sheet for the season, it may appear that Malkin is having a great season. It’s hard to be critical of a guy who has 33 points in 30 games, but anyone who has watched him as of late can see that he is a step slower and appears to be almost completely checked out. In his last three games, Malkin has zero points and has a minus-five rating (he was a minus-four against the Blackhawks on Wednesday night alone). It’s not like Malkin is being shown up by superstars, either. It’d be hard to give him too much hassle if he was being bettered by someone like Patrick Kane or Jonathan Toews, but the fact that he was consistently outworked by the Blackhawks’ fourth line on Wednesday night shows that something is wrong with him. On the Blackhawks’ first goal of the night, Malkin had a lazy backcheck, failed to clear the puck out of a mad scramble, and then “flamingo’d” on a Carl Dahlstrom shot toward the cage, which eventually deflected off Andreas Martinsen and behind Penguins’ goaltender Casey DeSmith. The whole shift was a disaster for Malkin, and things didn’t get any better as the game went on. If he is playing through an injury, the coaching staff needs to step in and let him take a few nights off to get him back to full health. Consistency has never really been Malkin’s bread and butter, but it’s hard to remember another four- or five-game stretch where he has looked this bad. If the Penguins are going to right the ship, Malkin simply needs to be better.